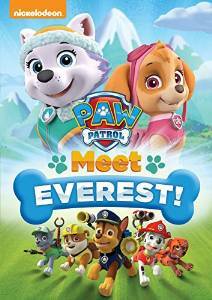 Top Notch Material: Paw Patrol: Meet Everest! Paw Patrol is a show that both of my boys love. It is amazing to find something that makes them both happy considering they are six years apart in age, but alas, Paw Patrol is it! I recently received a copy of Meet Everest for review, and am so glad I did. My older son and I was having an argument about who was the newest Pup to join the team, and he said Everest and I said Rubble. Turns out, he was right and I was wrong! Meet Evert proved him right, but has provided my boys with a lot of enjoyment, so I won't hold it against the movie! I highly recommend this DVD for all the other little Paw Patrol fans! This movie is available where other Paw Patrol movies are found.